Abstract: Respiratory tract infections (RTIs) in children are one of the most common reasons for parents consulting health professionals. Most RTIs are self-limiting viral illnesses that will resolve with time and supportive management. However, it is important for the health professional to identify any RTI that may have more serious implications for the child and require medical intervention. Diagnosis can usually be made from the history and presenting symptoms such as cough, wheeze, tachypnea, fever, or stridor. Exclusion of "red flag" symptoms will enable health professionals to appropriately reassure parents and advise symptomatic management with antipyretics and adequate fluid administration. With the expanding role of nurses in ambulatory settings, many children are now being seen by health professionals other than doctors, (eg, advanced nurse practitioners), some of whom are trained in pediatrics while others have limited knowledge of nursing sick children. It is therefore vital that these professionals remain aware of any risk factors and that they can recognize "red flags" in a sick child rapidly and escalate further management appropriately. Some children will require admission to hospital for respiratory support and other therapies, such as intravenous antibiotics and fluids. With advancement of the "non-medical prescriber" within the nursing profession, awareness of when to give or not give antibiotic therapy needs careful consideration, especially in light of the problems that may arise from overuse of antibiotic treatment. Nurses have a vital role, not only in administering medications and supporting other medical interventions, but also in supporting the child and family over the period of illness. The education of the parents and the child, in some instances, about prevention and avoidance to reduce the risks of any further RTIs must be addressed, including immunization and smoking cessation. Respiratory tract infections (RTI) in children are one of the most common reasons for consulting a health professional.1 RTIs are usually manifested by a combination of rhinitis, cough, sore throat, wheeze, and fever. The vast majority of these infections in children are managed in the primary care setting, with only a small number needing hospital admission. Acute RTI is one of the leading causes of childhood mortality. Data from the Office of National Statistics for England and Wales (for 2008 and 2009) show that RTIs accounted for around 4% of all deaths in children aged 0–14 years.2 This paper discusses the risk factors that health professionals assessing children should be aware of, as they can play an important role in identifying “sick” children earlier, thereby escalating further assessment by a pediatric specialist sooner, and in identifying the child who can be managed safely with reassurance and advice in their own home. There is also a discussion of the part respiratory nurse specialists can play and the increasing importance of their role in managing a significant proportion of children with chronic respiratory conditions in the community by providing support and expert advice. Although many of the symptoms of RTIs cross the boundaries of multiple conditions, in this paper the authors describe the common RTIs that a health professional assessing children will encounter and discuss pertinent “red flags” and treatment of these conditions and also appropriate “safety net” advice for families. The respiratory tract starts at the nasal cavity and ends in the alveoli (in the lungs). However, for easier description and understanding of pathologies, it can be divided into two parts. The upper respiratory tract refers to the structures of the respiratory system that lie outside the thorax or above the sternal angle, and consists of the nasal cavity and pharynx (including tonsils) through to the larynx. The lower respiratory tract begins with the trachea and also includes the bronchi and lungs. Cough and wheeze are predominantly described with a lower RTI while stridor is typically noted in an upper RTI.3 It is important to remember that a mixture of symptoms is often seen in children, and it may be difficult to label the presentation as an upper or lower RTI. RTIs are more common in the winter months, and this is likely due to children being in close proximity to each another as they tend to stay indoors more often.2,4,5 Unlike in adult practice, it is extremely important to remember that a child’s respiratory rate and heart rate will vary with age and the parameters are likely to be different from that in a normal adult. 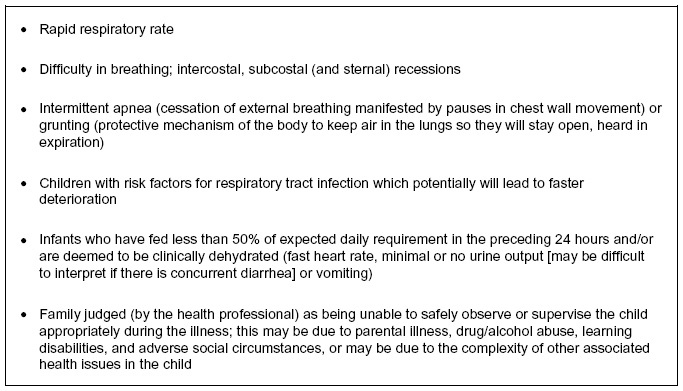 Health professionals need to compare a child’s vital parameters (heart and respiratory rate) with the levels highlighted in Table 1 before labeling these are abnormal for that specific age group. Note: Adapted from the Advanced Paediatric Life Support: The Practical Approach, 5th Edition, Advanced Life Support Group; edited by Martin Samuels, Susan Wieteska.60 Copyright © 2011, John Wiley and Sons. Unlike adults, children with a respiratory illness deteriorate more rapidly, and respiratory arrest needing resuscitation is usually the primary event. There are a number of reasons why children are more vulnerable to RTIs,1,2,4,6,7 and these are highlighted in Figure 1. Figure 1 Reasons for increased vulnerability in children with respiratory tract infections. Abbreviations: NHS, National Health Service; SIGN, Scottish Intercollegiate Guidelines Network. It is important that health professionals assessing children with a RTI identify any “red flags”, as this will enable them to plan the necessary management of the child at an appropriate level.2,5,6 The presence of one or a combination of these signs should prompt health professionals in the community to refer children early to secondary care services. 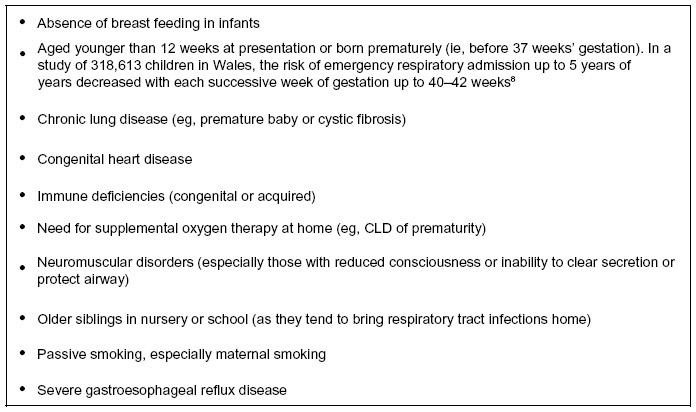 Further, health professionals in hospitals should be extra careful in discharging such children, or those with known risk factors for developing RTI (Figure 2)2,5,6,8 even if the initial presentation may be considered to be mild to moderate. The most common “red flag” signs are highlighted in Figure 3. Figure 2 Risk factors for respiratory tract infection. Abbreviation: CLD, chronic lung disease. Figure 3 Red flag signs in children with respiratory tract infections. The role of bronchodilators remains controversial, although some studies have highlighted minimal short-term benefits. A recent Cochrane review did not support use of bronchodilators in the routine management of bronchiolitis.18 A randomized controlled study found nebulization with hypertonic saline (3% or 6% sodium chloride) to be safe but this did not reduce the length of stay in hospital, duration of supplemental oxygen, or nasogastric tube feeding in children hospitalized with moderate-to-severe viral bronchiolitis, and its routine use is not recommended.19 A single dose of bronchodilator therapy may be used on a trial basis in severe cases, with monitoring of response and continuation of further doses may be decided on the basis of the initial response. Antibiotics should be reserved for selected cases in severely ill hospitalized infants with bronchiolitis where secondary bacterial infection is suspected. A Cochrane review involving 543 infants found minimal evidence to support the routine use of antibiotics in bronchiolitis; their use should be reserved for infants who have deteriorated enough to require continuous positive airway pressure support or mechanical ventilation.20,21 Infants in the community being treated for bronchiolitis should not be treated with antibiotics or bronchodilators. Cough and wheezing in EVW is always triggered off by a viral infection and may be associated with fever and coryzal symptoms. Children with EVW do not have any interval symptoms between episodes. The cough occasionally may be severe enough to induce vomiting.2 Rhinoviruses cause most cases of VIW; other causative viruses include adenovirus, influenza, parainfluenza, or RSV.24 The most important trigger for MTW is a viral infection, although these children also wheeze in response to other triggers, such as exercise, allergen exposure, passive smoking, and exposure to cold air,23 and do have interval symptoms between episodes of viral infection. Croup is predominantly caused by parainfluenza virus, although viruses such as influenza A are also known to cause viral croup.26 Although these symptoms are distressing for both the child and parents, the child is usually not seriously ill and in most cases can be managed in the community with supportive management. Children with only the barking cough may be managed safely at home with rehydration and antipyretics (particularly ibuprofen for its anti-inflammatory properties) and safety net advice to seek urgent medical advice if the child deteriorates or develops stridor. If the symptoms recur, the parents should be advised to move the child to somewhere where they can inhale cool air to reduce the inflammation in their upper airway and this may help to releive their symptoms. On the other hand, when a child with stridor presents with a raised temperature, drooling of saliva, or a toxic appearance, bacterial tracheitis or epiglottitis should be suspected, with urgent transfer to hospital. A study of 203 children from Australia28 aimed at differentiating symptoms predictive of croup (n=102) from epiglottitis (n=101) early in the illness found that both illnesses presented with stridor, but cough and absence of drooling suggested croup whereas drooling with absence of cough were more likely to be epiglottitis. Cases of epiglottitis have been substantially reduced since the introduction of H. influenzae type B vaccine, so it is important to enquire about the child’s immunization history when they present with a stridor. This is especially important in children who have recently immigrated from a developing country, not immunized or appears extremely unwell/toxic with croup like symptoms. This group of children often may have missed their routine immunizations and nurses play an important role in arranging catch-up immunizations. Health professionals should remain aware of the possible challenges that parents of infants with CLD may face in the community, so as to appropriately reassure or refer early to specialist services.2 It is also important that neonatal community nurses support parents in the community through regular home visits, arranging a ready supply of medicines or special feeds at home and disability living allowances. In a US study of 150 premature neonates who were randomly assigned to either community-based (n=75) or hospital-based (n=75) follow-up, both groups had similar developmental and health outcomes.31 It is also necessary to ensure that hospital outpatient appointments with different professionals are attended and that any developmental concern identified (which is more likely in these children) is highlighted early to appropriate professionals (developmental pediatricians). Community neonatal nurse support is common in the UK set-up, and is particularly helpful for families living in rural settings and families for whom access to a tertiary care medical facility is difficult. However, it is not uncommon for these children to get admitted with RTIs. Health professionals should refer these children early to the hospital in situations where a need for escalation of respiratory support becomes evident. While the medical management will be decided by the actual pathology of the respiratory illness, these children are better managed in a pediatric high-dependency set-up as they have the potential to deteriorate earlier. The pediatric early warning score (PEWS) is an established tool used in UK clinical practice. In a multicenter study of 2,074 patients in Canada, it was found that the PEWS was elevated and continued to increase in the preceding 24 hours before the clinical deterioration event.32 In our clinical experience, use of the PEWS in the care of patients with CLD admitted with respiratory deterioration has been found to be helpful, although testing in a large clinical set-up (or multi-center involvement) is necessary to determine whether this score will improve quality of care and patient outcomes. Tonsillitis is defined as an inflammation of the tonsils and is a common upper RTI in children. The etiology is usually a viral pathogen; however, bacterial pathogens such as Group A streptococcus are also known to cause tonsillitis. Tonsillitis usually presents with a sore throat that can feel worse when swallowing, high temperature (>38°C), coughing, hoarseness of voice, and headache.33 Symptoms usually last for 3–4 days before the child recovers. It is important that antibiotics are not prescribed haphazardly, and the presence of three or four Centor criteria (history of fever, tonsillar exudates, no cough, tender anterior cervical lymphadenopathy) may be used as a guide to consider prescription of antibiotics.34 The higher the score, the greater the probability that the throat infection has been caused by Group A Streptococcus. In cases where antibiotic therapy is deemed to be necessary, oral phenoxymethylpenicillin is the drug of choice and should be prescribed for 10 days.34,35 A throat swab may be obtained before commencing antibiotics. Inpatient admission will be required for patients with sore throat who have stridor, progressive difficulty with swallowing, increasing pain, or severe systemic symptoms.34 These patients will need intravenous antibiotics if they are unable to tolerate oral medicines or there is associated vomiting. The indications for tonsillectomy in children are not clear, and no study has demonstrated clear clinical benefits of tonsillectomy in children with recurrent sore throats. In absence of clear evidence, it is suggested that the benefit of tonsillectomy in children increases with the severity and frequency of sore throats prior to tonsillectomy. Figure 4 highlights the current indications for consideration of tonsillectomy for recurrent acute sore throat in both children and adults.34 Adenotonsillectomy may be required in children with obstructive sleep apnea and other rare conditions, such as periodic fever, but further discussion is beyond the scope of this paper. Figure 4 Consider referral for tonsillectomy. Protracted bacterial bronchitis is defined as the presence of chronic, isolated, moist cough (lasting continuously for more than 4 weeks) without any clinical findings suggestive of an alternative diagnosis and resolution of symptoms when antibiotic therapy is given for 2–3 weeks.43,44 In the past this has been referred to by different terminologies such as “chronic bronchitis of childhood”, “protracted bronchitis”, “persistent endobronchial infection”, or “pre-bronchiectasis”. There has been recent increased interest in the condition given that untreated protracted bacterial bronchitis can lead to bronchiectasis in some children. Various studies have supported a strong association between viral RTIs and episodes of exacerbation of asthma. However, the interaction between viral respiratory RTIs in infancy and childhood, and their role in the development of asthma or subsequent exacerbations is complex and intriguing.46 In a study of 2,531 children from the Oslo birth cohort who were followed from birth to 4 years of age, RTIs in early life was noted to increase the risk of developing bronchial obstruction during the first 2 years of life and developing asthma by 4 years of age.47 In a case-control study of 142 children with a diagnosis of asthma, 65 participants had acute asthma exacerbations and formed the study group while 77 children with well controlled asthma served as the control group. It was found that respiratory virus infection was associated with exacerbations of asthma (63.1% in cases versus 23.4% in controls) and rhinovirus was the most prevalent pathogen (60% in cases versus 18.2% in controls) associated with these exacerbations.48 Another study that looked at asthma control in 654 children aged 4–18 years reported a higher numbers of RTIs in the previous 12 months in children with a lower level of asthma control.49 The same study also reported that different types of RTIs contribute equally to poorly controlled asthma. This should be followed by a physical examination to identify relevant clinical signs to establish a diagnosis. It is important to remember that the methodical approach of inspection, palpation, percussion, and auscultation may not be applicable in young children. Observation is an extremely powerful tool for identifying a sick child, and it cannot be overemphasized that the time spent in observing the child will give a wealth of information that may not be elicited by trying to examine the child straight away, which may also further distress the sick child and lead to the child becoming uncooperative. The clinical examination should start with recording the respiratory rate and heart rate, and both should ideally be done for 1 minute.51 It is vital to use correct equipment to record temperature, oxygen saturations and blood pressure, because these will give valuable information regarding further management strategies for the child. An assessment of breathing effort, color, activity, abnormal breath sounds (eg, wheeze, stridor), and hydration status should also be done. It is important to identify an increased oxygen requirement in a child with CLD, and this should be considered as a sign of clinical deterioration. Further, previous scars from cardiac or lung surgeries would give an indication of previous comorbidities and help in deciding on the need for admission in a child with RTI. It is important that a child presenting with stridor is not examined with a tongue depressor because this can cause further distress and sudden airway obstruction (due to laryngospasm). Palpation is an important aspect of clinical assessment in identifying lumps, asymmetrical chest wall movement, crepitations, apex beat (if felt on right side may indicate dextrocardia), localized tenderness, or emphysema (this may be seen in association with pneumonia in children). Auscultation may need to be opportunistic in young children, and needs to be performed when the child is relaxed (preferably at the start of the examination). Table 2 highlights the auscultatory findings which are likely to be elicited in different RTIs. Table 3 highlights the common organisms causing RTIs in children; this will help the clinician in deciding appropriate management. Nurses have an important role in managing children with RTIs, both in the community and in the hospital environment. However, this role changes depending on the health infrastructure in different countries. In the UK, nurses are involved in managing children both in primary and secondary care, so are well placed for managing RTIs, one of the most common illnesses in childhood. 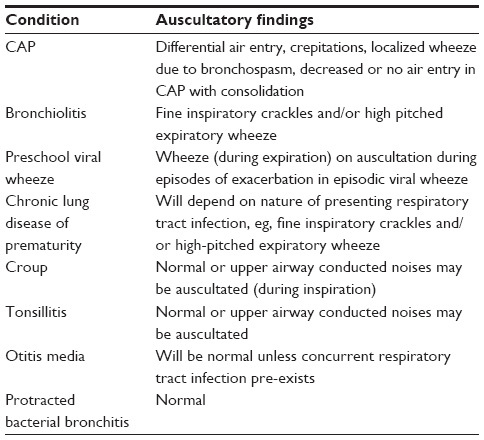 Table 2 Auscultatory findings in respiratory illnesses. 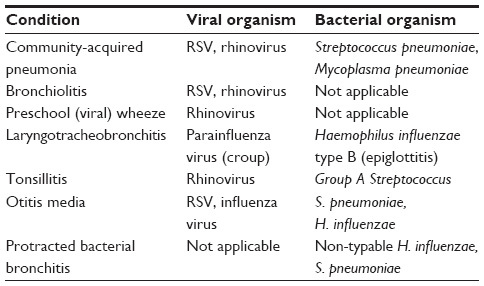 Abbreviation: RSV, respiratory syncytial virus. In the resuscitation situation, nurses in the emergency department will perform regular observations, administer respiratory support (eg, oxygen, continuous positive airway pressure) and medicines, ensure requested investigations are done, eg, a chest X-ray has been performed and acted upon. Nurses also need to ensure that parents are well supported in this vital period and are kept well informed about their child’s progress. Some children who need to be transferred to the pediatric intensive care unit will need to be transported to specialist centers, and it is important that the transfer process happens smoothly and in a time-critical manner. Once children have been stabilized in the emergency department, they will be transferred to the pediatric ward where their ongoing care will continue, including regular observations, ie, PEWS, administration of fluids and medicines, supporting nutrition, and personal hygiene.2 Communication with parents and ensuring that they feel involved in the care of their child is essential during this transition period. When the child is ready for discharge, nurses need to ensure that adequate supply of medicines are made available for continuing care. Signs of deterioration should be explained and the family should be informed of any hospital follow-up that has been arranged. There is an increasing spectrum of nurse practitioner roles identified in pediatric care that have been evolving for many years. While some areas of respiratory care, such as asthma53,54 and cystic fibrosis,55,56 have well established nurse practitioner roles, these roles may not be that easily identified in the management of children with acute RTI in the hospital environment. Emergency departments and pediatric assessment units are seeing changes in medical practice with the emerging role of the advanced pediatric nurse practitioner. Advanced pediatric nurse practitioners are trained to a level where they can autonomously assess and manage children to the level of a medical professional, including ordering investigations, planning medical and nursing care, and prescribing medications, while also undertaking nursing care. Another important aspect of managing RTIs in children is prescription of antibiotics (for bacterial RTIs). While it is important that antibiotics are prescribed with caution, as discussed previously, all prescribers, including non-medical prescribers, must have an understanding of where such prescriptions are likely to be beneficial.35 This knowledge will enable the practitioner to counsel families about the appropriateness of antibiotic therapy and reassure them when such therapies are not going to be of benefit to the child. Guidelines published in 2008 by the National Institute for Health and Care Excellence35 outline a care pathway for common RTIs (Figure 5). However, the final decision regarding prescription of antibiotics lies with the clinician, and will be decided depending on the clinical condition of the patient. Figure 6 highlights the antipyretics commonly used in clinical practice and also the rationale for using single antipyretic agent. Figure 5 Pathway for deciding antibiotics in respiratory tract infections. 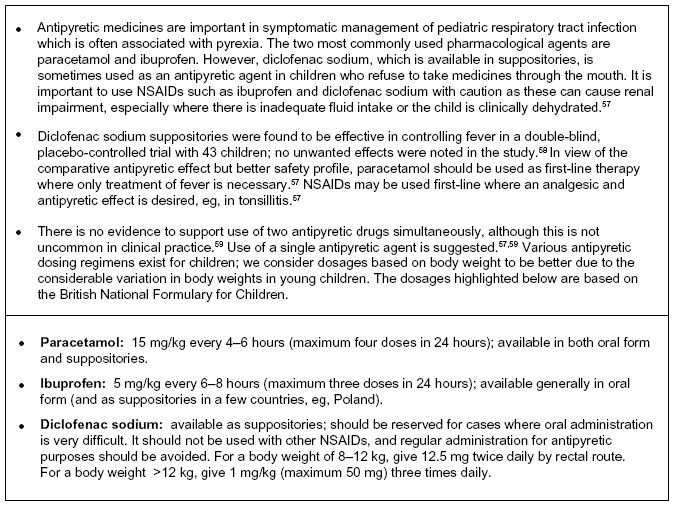 Figure 6 Antipyretic use in children. Abbreviation: NSAIDs, non-steroidal anti-inflammatory drugs. RTIs in children are common in clinical practice. Health professionals in the community play an important role in managing children with reassurance, guidance on symptomatic management, and referring early where escalation of care is necessary. Nurses in the hospital environment need to deliver a holistic care package whereby both medical and emotional aspects are addressed. The role of nurse specialists is being increasingly recognized in some areas of respiratory care, and needs further expansion both in primary and secondary care. Included in this expanding role is the value of health promotion to educate families, thereby improving uptake of immunization, which has a role in preventing serious RTIs, such as epiglottitis and pneumonias. Schaad UB. Prevention of paediatric respiratory tract infections: emphasis on the role of OM-85. Eur Respir Rev. 2005;14:74–77. Paul S, O’Callaghan C, McKee N. Effective management of lower respiratory tract infections in childhood. Nurs Child Young People. 2011;23:27–34. Gill D, O’Brien N, editors. Paediatric Clinical Examination Made Easy. 5th ed. London, UK: Churchill Livingston; 2007. NHS Choices. Respiratory tract infection. 2013. Available from:http://www.nhs.uk/conditions/Respiratory-tract-infection/Pages/Introduction.aspx. Accessed June 20, 2014. Harris M, Clark J, Coote N, et al. British Thoracic Society guidelines for the management of community acquired pneumonia in children: update 2011. Thorax. 2011;66(Suppl 2):ii1–ii23. Scottish Intercollegiate Guidelines Network. Bronchiolitis in children. SIGN guideline 91. 2006. Available from: http://www.sign.ac.uk/pdf/sign91.pdf. Accessed June 20, 2014. Snellman L, Adams W, Anderson G, et al. Diagnosis and treatment of respiratory illness in children and adults. Bloomington, MN, USA: Institute for Clinical Systems Improvement; 2013. Available from: https://www.icsi.org/_asset/1wp8x2/respillness.pdf. Accessed September 3, 2014. Paranjothy S, Dunstan F, Watkins WJ, et al. Gestational age, birth weight, and risk of respiratory hospital admission in childhood. Pediatrics. 2013;132:e1562–e1569. Clark JE, Hammal D, Hampton F, Spencer D, Parker L. Epidemiology of community-acquired pneumonia in children seen in hospital. Epidemiol Infect. 2007;135:262–269. Paul SP, Bains JK. Treating pneumonia in children. Independent Nurse. 2012:11; 24–27. Finn R. To X-ray or not in child with signs of pneumonia. 2008. Available from: http://www.jfponline.com/fileadmin/content_pdf/ped/archive_pdf/vol42iss7/70304_main.pdf. Accessed September 3, 2014. Thomson A, Harris M. Community-acquired pneumonia in children: what’s new? Thorax. 2011;66:927–928. Leyenaar JK, Lagu T, Shieh MS, Pekow PS, Lindenauer PK. Variation in resource utilization for the management of uncomplicated community-acquired pneumonia across community and children’s hospitals. J Pediatr. 2014;165:585–591. Nair H, Nokes DJ, Gessner BD, et al. Global burden of acute lower respiratory infections due to respiratory syncytial virus in young children: a systematic review and meta-analysis. Lancet. 2010;375:1545–1555. Paul SP. The assessment and management of an infant with bronchiolitis. Journal of Health Visiting. 2013;1:86–88. Whelan B. Nurse role in RSV management. Early Hum Dev. 2012;88(Suppl 2):S29–S30. McDougall P. Caring for bronchiolitic infants needing continuous positive airway pressure. Paediatr Nurs. 2011;23:30–35. Gadomski AM, Scribani MB. Bronchodilators for bronchiolitis. Cochrane Database Syst Rev. 2014;6:CD001266. Teunissen J, Hochs AH, Vaessen-Verberne A, et al. The effect of 3% and 6% hypertonic saline in viral bronchiolitis: a randomised controlled trial. Eur Respir J. 2014;44(4):913–921. 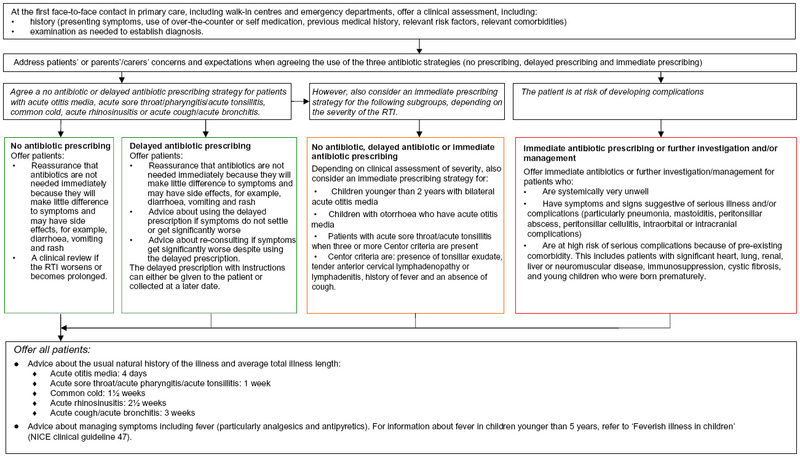 Spurling GK, Doust J, Del Mar CB, Eriksson L. Antibiotics for bronchiolitis in children. Cochrane Database Syst Rev. 2011;6:CD005189. Nagakumar P, Doull I. Current therapy for bronchiolitis. Arch Dis Child. 2012;97:827–830. Brand PL, Baraldi E, Bisgaard H, et al. Definition, assessment and treatment of wheezing disorders in preschool children: an evidence-based approach. Eur Respir J. 2008;32:1096–1110. Paul SP, Bhatt JM. Preschool wheeze is not asthma: a clinical dilemma. Indian J Pediatr. 2014;81(11):1193–1195. van Woensel JB, van Aalderen WM, Kimpen JL. Viral lower respiratory tract infection in infants and young children. BMJ. 2003;327:36–40. Bhatt JM. Recurrent wheeze in pre-school children. British Journal of Family Medicine. 2013;1:15–19. Bjornson CL, Johnson DW. Croup in children. CMAJ. 2013;185: 1317–1323. Narayanan S, Funkhouser E. Inpatient hospitalizations for croup. Hosp Pediatr. 2014;4:88–92. Tibballs J, Watson T. Symptoms and signs differentiating croup and epiglottitis. J Paediatr Child Health. 2011;47:77–82. Shargorodsky J, Whittemore KR, Lee GS. Bacterial tracheitis: a therapeutic approach. Laryngoscope. 2010;120:2498–2501. Groothuis JR, Makari D. Definition and outpatient management of the very low-birth-weight infant with bronchopulmonary dysplasia. Adv Ther. 2012;29:297–311. O’Shea TM, Nageswaran S, Hiatt DC, et al. Follow-up care for infants with chronic lung disease: a randomized comparison of community- and center-based models. Pediatrics. 2007;119:e947–e957. Parshuram CS, Duncan HP, Joffe AR, et al. Multicentre validation of the bedside paediatric early warning system score: a severity of illness score to detect evolving critical illness in hospitalised children. Crit Care. 2011;15:R184. NHS Choices. Tonsillitis. 2011. Available from: http://www.nhs.uk/Conditions/Tonsillitis/Pages/Introduction.aspx. Accessed June 24, 2014. Scottish Intercollegiate Guidelines Network. Management of sore throat and indications for tonsillectomy – a national clinical guideline. Available from: http://www.sign.ac.uk/pdf/sign117.pdf. Accessed September 3, 2014. National Institute for Health and Care Excellence Clinical Guidelines. Prescribing of antibiotics for self-limiting respiratory tract infections in adults and children in primary care. 2008. Available from: http://www.nice.org.uk/guidance/cg69/resources/cg69-respiratory-tract-infections-full-guideline3. Accessed September 3, 2014. Hawes D, Linney MJ, Wilkinson R, Paul SP. Lemierre’s syndrome: the importance of early detection. Br J Nurs. 2013;22:1075–1078. Coticchia JM, Chen M, Sachdeva L, Mutchnick S. New paradigms in the pathogenesis of otitis media in children. Front Pediatr. 2013;1:52. Jervis-Bardy J, Sanchez L, Carney AS. Otitis media in Indigenous Australian children: review of epidemiology and risk factors. J Laryngol Otol. 2014;128(Suppl 1):S16–S27. Ryborg CT, Søndergaard J, Lous J, et al. Factors associated with antibiotic prescribing in children with otitis media. ISRN Family Med. 2013;2013:587452. Goossens H, Ferech M, Vander Stichele R, Elseviers M; ESAC Project Group. Outpatient antibiotic use in Europe and association with resistance: a cross-national database study. Lancet. 2005;365:579–587. National Institute for Health and Care Excellence CKS. Otitis media – acute. 2009. Available from: http://cks.nice.org.uk/otitis-media-acute#!scenariorecommendation:2. Accessed May 7, 2014. Paul SP, Wilkinson R. The importance of recognising mastoiditis in children. Nurs Times. 2012;108:3. Craven V, Everard ML. Protracted bacterial bronchitis: reinventing an old disease. Arch Dis Child. 2013;98:72–76. Paul SP, Hilliard T. The importance of recognizing protracted bacterial bronchitis in children. Indian J Pediatr. 2014;81:1–3. Marchant J, Masters IB, Champion A, et al. Randomised controlled trial of amoxycillin clavulanate in children with chronic wet cough. Thorax. 2012;67:689–693. Mackenzie KJ, Anderton SM, Schwarze J. Viral respiratory tract infections and asthma in early life: cause and effect? Clin Exp Allergy. 2014;44:9–19. Nafstad P, Magnus P, Jaakkola JJ. Early respiratory infections and childhood asthma. Pediatrics. 2000;106:E38. Khetsuriani N, Kazerouni NN, Erdman DD, et al. Prevalence of viral respiratory tract infections in children with asthma. J Allergy Clin Immunol. 2007;119:314–321. Zomer-Kooijker K, Uiterwaaal CS, Verschueren KJ, et al. Respiratory tract infections and asthma control in children. Respir Med. 2014;101(10):1446–1452. Ahanchian H, Jones CM, Chen YS, Sly PD. Respiratory viral infections in children with asthma: do they matter and can we prevent them? BMC Pediatr. 2012;12:147. Lakhanpaul M, Stephenson T, MacFaul R, Werneke U. A clinical guideline for the management of children presenting with acute breathing difficulty. 2004. Available from: http://www.rcpch.ac.uk/sites/default/files/asset_library/Research/Clinical%20Effectiveness/Endorsed%20guidelines/Children%20Presenting%20with%20Acute%20Breathing%20Difficult/Breathing%20difficulty%20guideline.pdf. Accessed September 3, 2014. Fabrellas N, Vidal A, Amat G, Lejardi Y, del Puig Deulofeu M, Buendia C. Nurse management of ‘same day’ consultation for patients with minor illnesses: results of an extended programme in primary care in Catalonia. J Adv Nurs. 2011;67:1811–1816. Kuethe M, Vaessen-Verberne A, Mulder P, Bindels P, van Aalderen W. Paediatric asthma outpatient care by asthma nurse, paediatrician or general practitioner: randomised controlled trial with two-year follow-up. Prim Care Respir J. 2011;20:84–91. Tolomeo C. Toward better clinical asthma management. The nurse practitioner as asthma educator. Adv Nurse Pract. 2007;15:26–32. Brown RF, Willey-Courand DB, George C, et al. Non-physician providers as clinical providers in cystic fibrosis: survey of US programs. Pediatr Pulmonol. 2013;48:398–404. Vandenbranden SL. The role of the nurse practitioner in the care of children with chronic respiratory disorders. Pediatr Ann. 2010;39: 800–804. Litalien C, Jacqz-Aigrain E. Risks and benefits of nonsteroidal anti-inflammatory drugs in children: a comparison with paracetamol. Paediatr Drugs. 2001;3:817–858. Polman HA, Huijbers WA, Augusteijn R. The use of diclofenac sodium (Voltaren) suppositories as an antipyretic in children with fever due to acute infections: a double-blind, between-patient, placebo-controlled study. J Int Med Res. 1981;9:343–348. Banks T, Paul SP, Wall M. Managing fever in children with a single antipyretic. Nurs Times. 2013;109:24–25. Advanced Life Support Group. Advanced Paediatric Life Support: The Practical Approach, 5th Edition. edited by Martin Samuels, Susan Wieteska. 2011.